Haresign is a wonderful surname, and a perfect example of English dialect resulting in the transposition of both spelling and pronunciation to produce something quite different from its early origins. Like I'anson and Odell as examples, Haresign is a corruption, although probably not intentionally so. It is in fact another version of Harrison (son of Harry or Henry) as I'Anson is of Janson or Johnson, and O'dell is a concertina form of "Of the dell", and not Irish at all! Harrison is one of the oldest of English patronymic surname and it is interesting to see that in 1355 one Robert Harriesone was recorded in the court of Pleas, London whilst in 1455 John Harryson, also spelt as Herrison is recorded in the Sheffield (Yorkshire) Rolls. 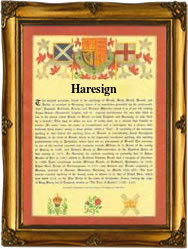 As to when precisely the spelling of "Haresign" was first recorded is uncertain, but John Hareson (the link spelling) is recorded as marrying as Agnes Burton of Kirton in Lindsey, Lincoln on October 13th 1592, whilst on May 21st 1821 John Haresign married Ann Kennewell at Gosberton Lincoln. The first recorded spelling of the family name is shown to be that of Henry Hennerisone, which was dated 1354, in the "Putnam Rolls of Cheshire", during the reign of King Edward 111, known as "The Father of the Navy", 1327 - 1377. Surnames became necessary when governments introduced personal taxation. In England this was known as Poll Tax. Throughout the centuries, surnames in every country have continued to "develop" often leading to astonishing variants of the original spelling.